Success differs from person to person. For some people, successful life means being doctor, engineer, teacher, sports man, etc. But for some people, successful life means having a small family with luxuries and all. Nowadays, your career makes your life successful. Success is, or at least should be, primarily defined as an achievement of something desired. So, the most successful people are the ones who achieve the things they most desire. What we desire the most, even more than money, is to be proud of what we do with our lives. This is especially true when it comes to our work. A truly successful person is one who is proud of the work he or she does. So, being successful just means that you make full use of your potential. It means that you grow throughout the course of your life. Sad times may affect you, but if you are strong enough to keep going and growing in that phase also, then yes you are successful. Being successful doesn't mean being rich, being famous, it never means a happy life. You know you are truly successful when you are satisfied with your own inner self, you are proud of your own accomplishments.The true meaning of success goes far beyond the common definitions of success, such as having a lot of money, being wealthy, having a lot of tangibles and earned degrees. Quite the opposite: true success in life cannot be measured with the above-named factors, but instead with the amount of people that are able to live a better and more advanced life because of what you created. This is the true meaning of success. Not the trophies people are collecting in their lives. Media and society let us often conclude that living a successful life means to be extraordinarily wealthy and have a lot of tangibles. But the meaning of success is to live a happy life and to make this world a better place for everyone. 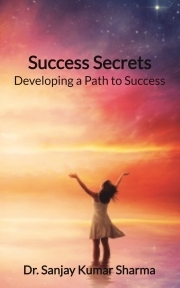 Dr. Sanjay Kumar Sharma is the acclaimed author of ‘Success Secrets’. He has been passionate about writing and has a strong interest in teaching for over two decades. Currently, he is Professor in Electronics and Communication Engineering, KIET, Ghaziabad. He began his career in 1998 in teaching. The Educational background of Dr. Sanjay Kumar Sharma includes B.E. in ECE, M. Tech and Ph.D. in Engineering. He has been an author of various Text Books in Engineering Stream. He also loves to write self-help and historical fiction books. His educational background has given him a broad base to approach a lot of topics (Education and Experience).